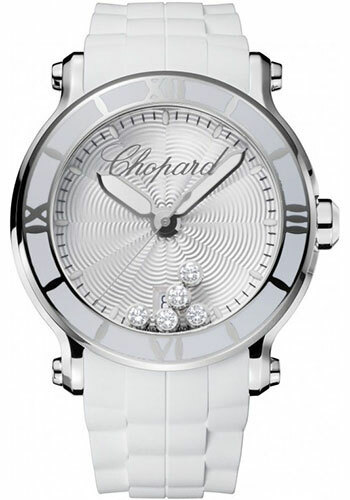 Extra large size (42 mm) stainless steel case with 5 mobile diamonds, silver dial, quartz movement with hours, minutes, seconds, and date, white rubber strap. Water resistant to 30 meters. Extra large size (42 mm) stainless steel case with 5 mobile diamonds, diamond bezel, silver dial, quartz movement with hours, minutes, seconds, and date, white leather strap. Water resistant to 30 meters. 42mm stainless steel case, stainless steel crown, black engine turned dial with moving diamonds, quartz movement with hours, minutes, seconds and date, black rubber strap, stainless steel pin buckle. Water resistant to 30 meters. Extra large size (42 mm) stainless steel case with 5 mobile diamonds, diamond bezel, black dial, quartz movement with hours, minutes, seconds, and date, black leather strap. Water resistant to 30 meters.